Hello, I'm Gregor and I put this site together. At first, you'll find an overview of recommended truck bed liner kits, followed by a public poll and a general buying guide on truck bed liner kit. Further down on this page, we do link to other well-written articles and reviews about truck bed liner kits. At last, you'll be able to weight in your own opinion in the comments section. If you also want to vote on the best truck bed liner kit, click here to view the poll. Regardless of the type of truck you own, you'll likely want to upgrade the bed with a bed liner. The interior of your bed can easily be scratched or dented while hauling cargo. Damaged beds aren't merely an eyesore; once the finish on your bed has been damaged, it becomes vulnerable to corrosion. You can buy shells and mats to protect the bed, but both of these options can still lead to corrosion. 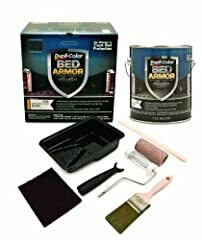 Neither product adheres to your bed on a chemical level, allowing corrosive agents to seep in underneath the liner and sit on the bed directly. If you want to give your bed the best protection, a chemical spray-on or roll-on bed liner is your best bet. However, hiring a professional to install your liner can be expensive. If you're confident in your skills and willing to put in the extra work to research liner kits and prep your truck for the installation, you can save significant amounts of money by purchasing a liner kit and installing it yourself. 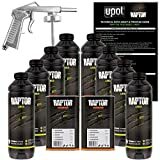 Spray-on liner kits use a spray gun of some type to spray the liner onto the surface, similar to a paint gun or a can of spray paint. Brush-on liner kits use a paint roller or paint brush to apply the lining material. Aliphatic coatings are typically more expensive. They'll take a wider range of colors and are more resistant to fading over time. They also take longer to cure after application. Aromatic coatings are easier to apply and take less time to cure after application, but they offer limited color choices and are vulnerable to fading with time. 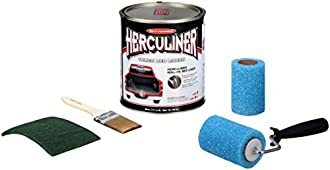 Most DIY liner kits are based around a chemical known as polyurethane. Polyurethane coatings are hard, strong and flexible; for most applications, these coatings will be up to the task. 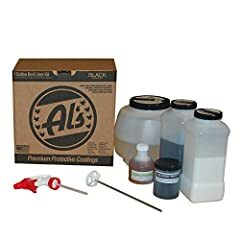 Some kits use an epoxy coating in lieu of a polyurethane coating. Although epoxies do work as a sealant and an adhesive, they don't have the strength or flexibility of a polyurethane coating. Under tougher conditions, an epoxy-based kit is more likely to fail. Before you can choose the best liner kit, you need to answer some questions about how you'll be using your truck. The type of work conditions your bed will encounter should help you narrow down your choice of kits. If you expect to haul cargo frequently, you'll need a liner kit that can stand up to constant abuse. Expect to pay more for a tougher kit or to skimp on aesthetics in favor of strength. If you'll frequently be hauling cargo on rough or nonexistent roads, you'll need a liner bed with enough flexibility to cope with the added stress of constant bumps. An extra-hard coating might crack when you go over a particularly rough patch of road. If you expect to haul cargo with hard surfaces and sharp edges, you'll want a harder, stronger coating. Softer, less demanding cargo may call for a liner with more flexibility for increased longevity. 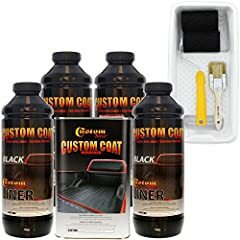 Many brush-on coatings contain textured materials to keep your cargo in place. 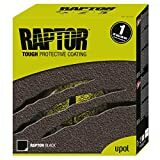 These non-slip coatings are good when you're driving, but if you'll mostly be sliding your cargo into the bed from the tailgate, you may regret these slip-resistant liners. A liner with less slip resistance can help you slide cargo into place. If you'll mostly be lifting cargo into place, a rough and textured liner is probably your best bet. Some bed liners are made with chemicals that don't stand up to solvents, oils and other chemicals very well. If you'll be hauling containers filled with chemicals that might spill, make sure that your liner kit can withstand these chemicals. For some truck owners, utility trumps everything else. Other truck owners want their trucks to look good while working hard. If appearance is important to you, make sure that you select a liner kit with good UV resistance. Aliphatic coatings tend to resist UV radiation better than aromatic coatings, allowing the bed liner to retain its original appearance. Most people who buy truck bed liners plan to use them on metal truck beds, but those aren't the only applications for these kits. Truck bed liner kits can be used on any surface that demands a protective coating to help resist corrosion and surface damage. If you're planning to use your liner kit on a wooden, concrete or plastic surface, make sure that your kit is designed to adhere to those types of surfaces. After evaluating your needs, you can set to work choosing the right kit for your truck. Begin by evaluating the application method. Brush-on kits are easier for most users to apply and require no special skills or equipment beyond brushes, rollers and masking tape. It's also easier to touch-up damaged areas with a brush-on kit. 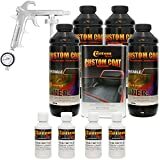 Spray-on kits typically offer more even coatings with less waste, but you do need a steady hand and lots of prep work to make sure you won't overspray your truck. You may need special equipment, such as an air compressor or a spray gun, and you'll need to make sure that the kit adheres to your local environmental laws. 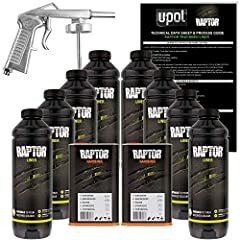 Finally, sprays can be finicky and must be mixed to the right consistency; if the solution is too thick, it might clog the nozzle. No two truck owners are the same, and each has their own specific needs that will dictate the best kit for their situation. However, many groups of truck drivers have similar needs, and for each group there are specific kits that offer the best performance. These kits have been on the market for many years with thousands of satisfied users, so if you just want to pick a kit and get started, it's hard to go wrong with one of these kits. 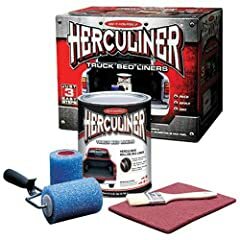 If your truck works as hard as you do, and you don't have the time to learn a lot of special skills that you won't use again, the Herculiner HCL1B8 is a great starting point. This brush-on kit is easy to apply and doesn't require much in the way of prep work. 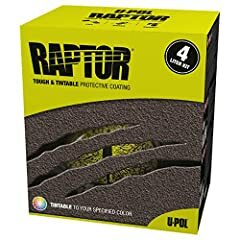 It's long-lasting, tough as nails, and resistant to most chemicals that it's likely to come into contact with, including gasoline and oil. However, this aromatic kit offers no UV protection, so expect to touch it up regularly if you want it to look good. If your truck is just as much a way of life as a tool, you might want to invest a little bit more time and effort into making it look the way you want. Al's Liners offers a spray-on kit that's tintable, allowing you to custom-blend the color of your liner. The kits are available in a number of different colors, or you can use automotive tints to create a custom color. 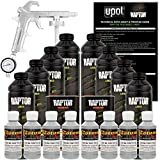 It doesn't come with a spray gun or any other type of applicator, so you'll need to budget a little extra to account for this. 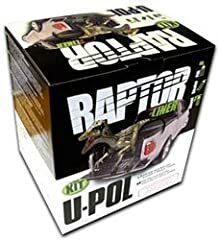 For those who push their trucks to the fullest, the U-POL 0820V Raptor liner kit is a good choice. The kit contains a spray nozzle applicator and a base tint, although you can choose your own tint if you prefer. Once it's cured, the surface is hard, strong, waterproof, soundproof and chemical-resistant. It also includes a UV blocker in the formulation, so the liner will stay in good condition even when exposed to frequent sunlight. The installation procedure for this kit is more involved than most DIY kits, so make sure you're up to the task before you commit to the Raptor. With a quality bed liner in place, your truck will be protected from scratches and corrosion. Always read reviews and research each kit thoroughly before you buy, and remember that the final quality of your finish is heavily dependent on your prep work. With solid prep and good research, a bed liner kit can keep your truck looking good for years to come. New: Our editorial list of additional articles. We decided to gather informartion all around the internet and present you a list of helpful, external links to interesting reads about the best truck bed liner kits and their reviews and guides. You're not convinced by the previous writings about truck bed liner kits? Of course you can just choose by visual impression, that's why we present you all our chosen products at a single glance. A click on any image is enough to open an external link to the best offer we could find. Finally, we want to present you our rating criteria for our truck bed liner kit comparison, so you can better understand and comprehend our recommendations and the rating process itself. Furthermore, we still ask you to keep your eyes open for short term deals in order to make some great bargains with truck bed liner kit in 2019. Published by G. Krambs on StrawPoll.com (last update on 2019-04-23 08:06:00). 14 of 19 readers found this article helpful.